I've been beta testing this product by TST and I have been loving it. It really cleans up the look of the bike and completes the rear end. It is brighter than the OEM unit and gets lots of compliments from other riders and overall just looks like it belongs on the bike. It is a solid design with no flaws. If you're looking for an integrated tail light, you can't beat this unit when it comes to bang for your buck. TST is by far the best company I've purchased items from. Everything I've purchased is plug-and-play and this rear light is exceptional. So easy to install, no headaches and fit perfectly. Every FZ-09 owner should buy this product. Just purchased the new integrated tail light with the fender eliminator kit and good lord what a difference! This tail light is sleek and streamlined to match the body lines of the bike. The brightness is unreal from this thing! Put it to you this way, the running light is the same brightness as the brake light on the OE setup. TST has done it again with another quality build. Fast, Friendly and Competitive pricing. FZ-09 is a great bike but the tail light never quite did it for me. This tail light looks like it should have came that way from the factory. Love the light cleans up the rear end of these bikes. Was impressed with the brightness of this light. Looks like the middle of the light is clear I assume to not dim the brake light. Brake light seems a decent bit brighter than stock and I was pleasantly surprised by how bright the turn signals were even though i got the smoked lens. I also really like the halo look it makes with just the running light. Along with a fender eliminator and removing the pumpkin stock tail lights, it almost looks like a different bike. Disadvantages: - None, Very happy with the product! Wow! This tail light is hands down one of the best mods I've made to this bike. 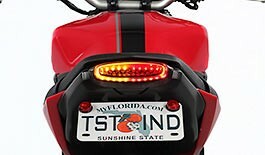 Unlike other, mostly cheaper, integrated tail lights for this bike and others, you can actually SEE the turn signals! They're clearly visible both day and night. The tail and brake lights are both just as bright, if not brighter than the stock light. 10/10 would buy again. Advantages: Turn signal visibility, easy to install, bright! First off I wanna begin by saying TST industries has some of the best customer service I've ever dealt with! Fast responses to my questions, and fast shipping! Also got a 10% military discount which was an added bonus. Now on the taillight, amazing product! This is my first purchase from tst industries, and I was very pleased with their build quality on this piece. It was super easy plug and play installation and I had no fitment issues whatsoever. The tail light really complements the overall design of the fz-09 with its sharp and sleek edges. Also the led's are far brighter than stock , and the unique oval led pattern makes it very easy to see the turn signals. Best bang of the buck tailight for the Fz-09 on the market hands down! Might I mention first 20 gets a free relay with the purchase ! So if you're looking for an aftermarket tailight that upgrades the design and functionality of the stock one, for under 80$ , look no further! Great product! Fits perfect and looks good. Shipping was super fast as well. Thanks again guys! Advantages: Smoked lens. Plug and Play. This tail light is amazing in every way, it follows the lines of the bike so well. I prefer this one over the Rizoma tail light. Another quality product from TST! I bought this in smoke color and really like it. It is by far the best looking integrated tail light in the market for the fz09. Its bright, fits well, installs easy and is plug and play. Tst have it nailed a good product with lots of product support and online install videos. Advantages: Get rid of that ugly after thought tail light and clean up the back of the bike. Brighter than stock. Excellent product, the bike should have looked like this from the beginning.